Here are some benefits of doing Distance Learning MBA (PGDM) from IMT Centre For Distance Learning (IMT CDL). Course Modules: The course modules crafted by the faculty of IMT are very descriptive. Alumni of the college has indeed complimented the university’s effort to create understandable and definitive course modules that has helped them in gaining a quantitative and qualitative analysis of the whole course. Assignments created from a learning perspective which triggers interest and performance in students. Facility of in-house classes to motivate team work and break the monotony of online classes. Clearance rate of the course is high unlike other distance education providers. Best e-learning tool that has been recognized by integral award franchises. IMT faculty imparts its management classes using Expert Connect Classroom Edu-Genie. IMT is known to assign their students with action case-studies that helps them synthesize, evaluate and apply the learnt concepts well on time. IMT CDL Offers the following 5 specializations with their distance education MBA (PGDM) programme. Students can also opt for the dual specialization program. An additional fee need to be paid for the dual specialization. 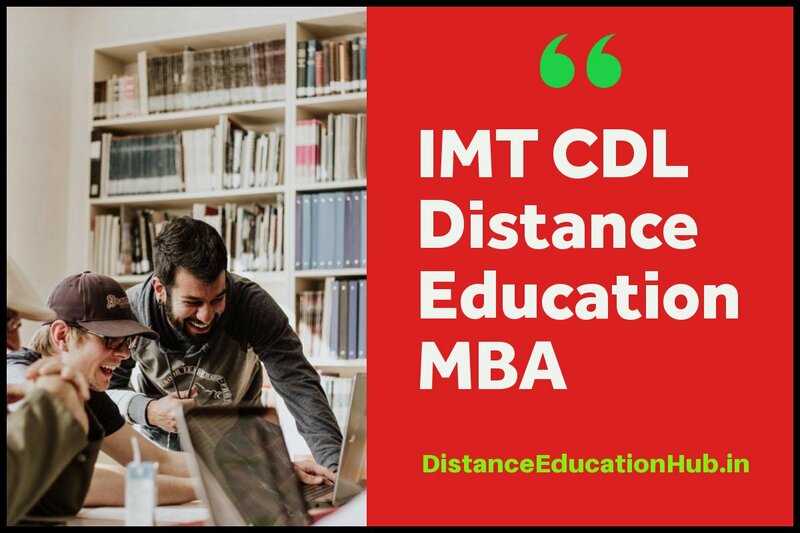 Applying for IMT CDL distance education MBA (PGDM) only requires a candidate to be a graduate from any college or university recognized by Association of Indian Universities. Candidates with work experience are preferred in IMT; However it is not a mandatory eligibility criteria, but the college management insists aspirants to have a minimum work experience of at least 3 years. This would act as an added advantage while pursuing the course. Applying in IMT is easy. Candidates can log onto the company’s website where they can have an access to the web-application form. Complete the application form with all valid details. You can pay the first fee through online or through a demand draft. Fee details are briefed below. In order to get a clearance of the course and its scope, students can speak to the admission counsellors of the university or visit the campus. Students can buy the prospectus from the college and interact with faculty as well in order to know more about the course and its future scope. Proof of residence i.e. Passport/Aadhar Card/PAN card/ Electricity or Phone Bill/Driving Licence/ or any Bank account statement if none of the above mentioned are available- One Photocopy of either of the above are required. Undertaking for any GAP in education and any dependency like backlogs and result-awaited. Per semester fee of any management program under IMT-CDL is 22,000 INR. The reading material has to be purchased separately which costs around 2500 INR per semester. The digital library is made available by the university for every student at the cost of 500 INR, every month. The examination fees for every semester is around 2500 INR. All in all, the total per semester fees of any MBA course under the IMR offering is around 27,500 INR. Students can pay the fees in lump sum as well. Fees can be paid online through debit card/credit card or offline as well via a Demand Draft at 'Institute of Management Technology - Centre for Distance Learning'. If all the above points are in the best interests of the recruiter, chances are a good MBA aspirant can get around 35,000-65,000 INR per month from any decent Multi national company. Even startups these days offer the similar package to MBA grads.